Right now the only streetcar in Los Angeles is that annoying tourist trap at The Grove and Farmers Market (pictured above with Portland streetcars). 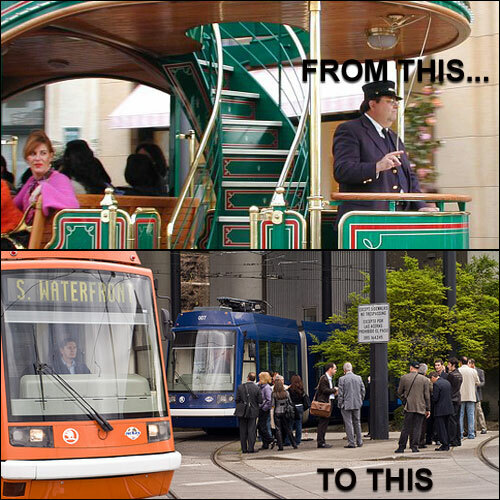 It is a nice reminder of our glorious streetcar past but also makes people believe that streetcars are some sort of relic from another era. Of course in places like Paris and Portland, modern streetcars are very much a reality. Well, that will change soon. L.A. is one of twenty-two American cities considering building streetcar lines. And it may be a reality within a couple of years thanks to the Obama Administration making it easier to obtain federal funds. Los Angeles Streetcar, Inc. and its partners in February submitted a $25 million federal grant application for a downtown streetcar line along Broadway. $280 million in grant money was made available this year by the Department of Transportation Secretary Ray LaHood.